The Sartell-St. Stephen school district received a generally favorable report from KDVBergan Auditors at the Oct. 15 regular school board meeting. The only major misstep on the district’s part was that in the student activities account no established procedures existed that would provide assurance that all cash collections are recorded in the accounting records. In addition, the district’s student activity accounts did not have adequate segregation of accounting duties because of a limited number of office employees. Auditor Nancy Schulzetenberg said that was a problem in many districts and it was understood that because of the number of staff needed to properly segregate all of the accounting duties, the cost of obtaining desirable segregation of accounting duties exceeded the benefits. So long as the district keeps a sharp eye on the accounts and continually monitors the accounting system, including changes that occur, this situation should be able to be maintained as it is. The audit revealed the district had $182.3 million in assets, but had $209 million in liabilities on June 30, 2018, which was the end of the 2017 fiscal year. Net position at the end of fiscal year 2017 was a negative $7.2 million. The negative net position exists for several reasons, including capital assets used in governmental activities are not current financial resources and, therefore, are not reported as assets in governmental funds. Also, deferred outflows of resources and deferred inflows of resources are created as a result of various differences related to pensions. Superintendent Jeff Schwiebert said management of the district is in good shape and that even with the addition of funds from the upcoming referendum, Sartell is still lower in spending than many comparably sized districts throughout the state. In the action items portion of the meeting, the board voted to approve the auditor’s report. Things are moving along very smoothly for high-school construction, Project Manager Lee Gruen said. He gave his assurances the building will be finished by the start of the school year in 2019. During the last month, the project has continued to make progress toward complete building enclosure and finishing stages of the project. In general, the project continues to track on schedule. The weather has affected exterior and interior work, causing minor delays in some activities. Work continues with contractors to maintain critical dates. With the cold weather coming early this year, its likely that external heat will need to be pumped into the building. That will drive up the cost of construction. Schwiebert commented people who toured the building were very impressed with it. “It will last the community for quite sometime,” Schwiebert said. 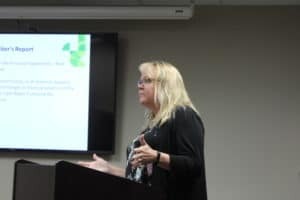 During the superintendent’s report, Schwiebert mentioned a candidates’ night with five school-board candidates had been scheduled. • Approved MSBA Policy 722 as part of the annual review of groups of existing policies. The policy deals with the collection, maintenance and dissemination of public data as provided in state statutes. • Approved a student-teaching contract with St. Cloud Technical & Community College. At meeting’s end the board went into closed session to deal with negotiation strategies. 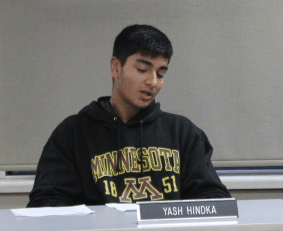 New student board representative Yash Hindka provides the board with a thorough review of student activities since the last board meeting in September. Among the activities were fundraisers to fight breast cancer, production of a student play and an anti-bullying campaign to educate students about the issue of bullying, as well as a rundown on the success of the soccer teams advancing to sections and the swim team taking second in True Team competition. Nancy Schulzetenberg of KDVBergan Auditors makes a point about accounting practices during the Oct. 15 regular board meeting. The district is in fine financial shape overall the board was told.